If you have been wondering why there has been more than a two week gap in this blog, it is because the Vole has been going places, firstly on a bike tour in the New Forest, genially hosted by Colin Waters (previously of Harrow Cyclists, and before that, Tower Hamlets Wheelers, but now living in Sway, Hampshire), and, secondly, and more importantly, on the Cycling Embassy of Great Britain study tour in the Netherlands. Of that, there will be much more on here in due course. At the moment I will merely remark that the landscape of Drenthe, the north-eastern province of the Netherlands, where the tour went, is, in its wilder parts, remarkably similar to that of the New Forest. We often think of the Netherlands as a crowded country, the land intensively cultivated if it is not built on, but here, in the "Dutch highlands", the least densely populated part of the Netherlands, there is forest and sandy heathland dominated by gorse and heather. Several National Parks have been established here. Here we can find the hunebedden (Dutch for "giants' beds"), the remains of megalithic burial sites constructed from large stones, where possibly an original surrounding earth mound has been eroded away. 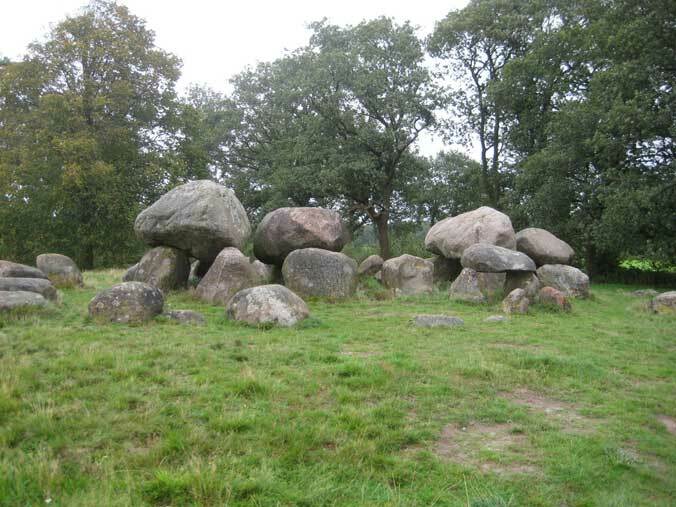 These are similar to the dolmens of Britain and Ireland. The Drenthe heathland looks very similar to the New Forest, but there is a big difference in how you can access it by bike. You cycle around the New Forest National Park on roads that generally have a 40mph (64kph) speed limit and are full of cars. There is some human and animal traffic calming provided by the cyclists and horses on the roads, but, personally, I would prefer not to be used as traffic calming, and, I suspect, neither would the horses, about 50 of which are killed on the roads each year. The roads are typically narrow, and, as a new development, often have extra pinch points built into them, where two cars cannot pass each other, but there is no clear priority indicated on the road. These are intended to slow traffic, but, of course, cyclists have not been considered, and these confusing pinch-points pose extra danger for them. 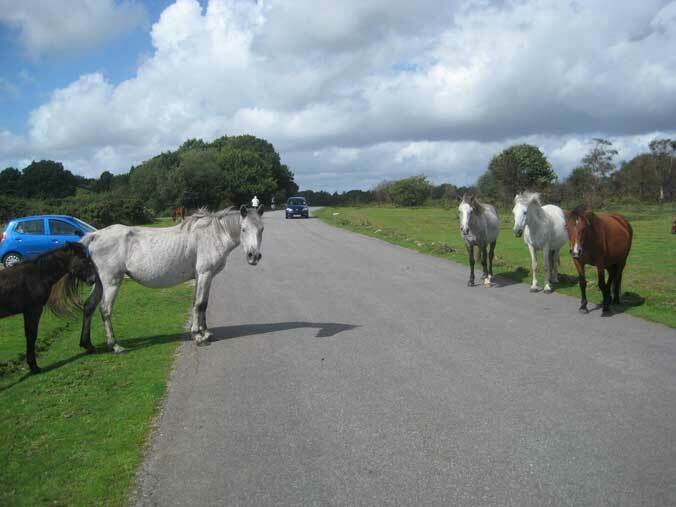 The traffic calming used in the New Forest. Nobody asked the horses if they wanted this dangerous job. The New Forest is lovely, but, overall, I am afraid I did not find cycling there a very relaxing experience. On one occasion a motorist sounded his horn at our party, overtook on a blind bend with inches to spare, and swore at us, shouting we should be riding in single file – which we were, but clearly not in the precise straight line right at the edge of the road that he would have liked. With the pressures of traffic and the behaviour of motorists, conditions for cycling in the New Forest are certainly far worse now than they were when I cycled there as a boy, living in nearby Christchurch, thirty and more years ago, and they were not fantastic then. The bridle paths in general are not suitable for cycling on with non-mountain bikes. It is not possible, on a normal bike, to get away from heavily-used roads and experience a quiet or really relaxing environment. The Dutch, of course, have a different approach. 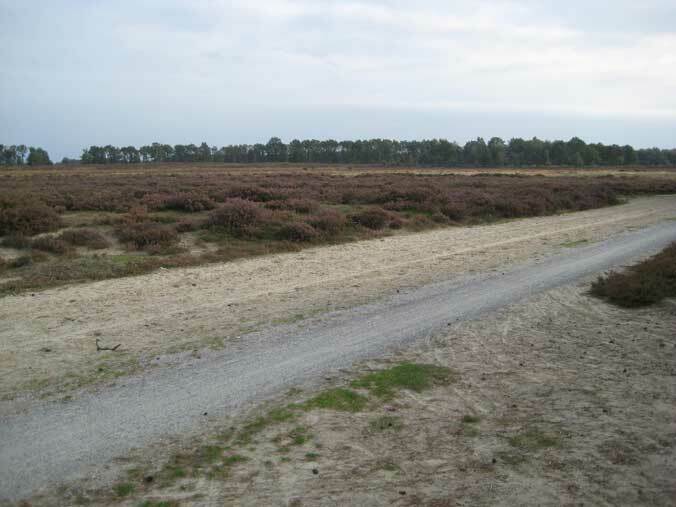 They have designated areas of the Drenthe heathland and forest as "quiet areas" where there is no intrusion of traffic. Neither is overflying allowed. The Dutch have decided that peace and silence, or at least, freedom from most human-generated sound, is a valuable natural resource to be conserved in such places, along with the rest of the natural environment. So these areas can only be visited by a substantial walk, or on horseback, or, more practically, by a short bike ride. The quiet area we visited on the first day of the Cycling Embassy study tour with David Hembrow was located in the Drenthe Aa National Park near Assen. It was accessed on the path shown in the photo below, a sandy bridle path with a hard edge for cycling. 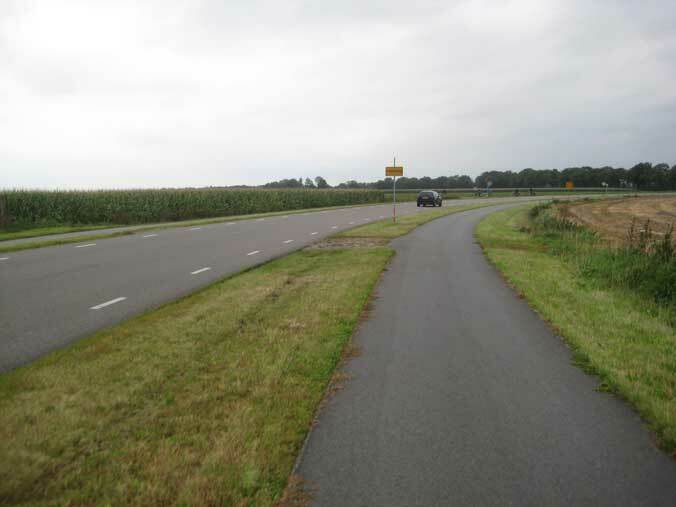 The heathland path was in turn was reached from the town on high-quality cycle paths alongside country roads, but generally slightly separated from them, like the one shown below. There was not a great deal of traffic on these roads, but still, the separation from it made a world of difference to the journey. Note that here quite a quiet road has ample cycle paths on both sides of it, separated from it by a substantial grass strip. The road itself is effectively narrowed by the dashed markings, encouraging slower speeds from drivers. Nevertheless, note how slowing traffic is not regarded as enough in the Netherlands. If there is space for separate cycle tracks, they are generally provided as well. 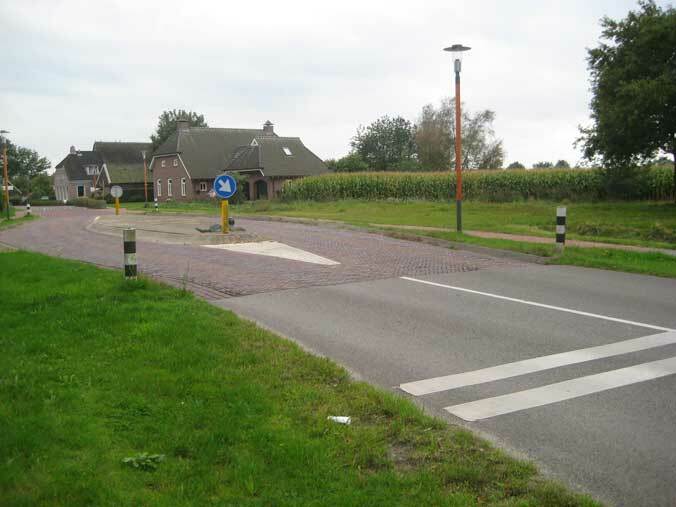 Where these roads passed through villages, where separate cycle paths could not be provided due to limited space between the houses, traffic calming, as shown below, plus signs, was used to reduce traffic speeds to the usual Dutch urban limit of 30kph (18.5mph). 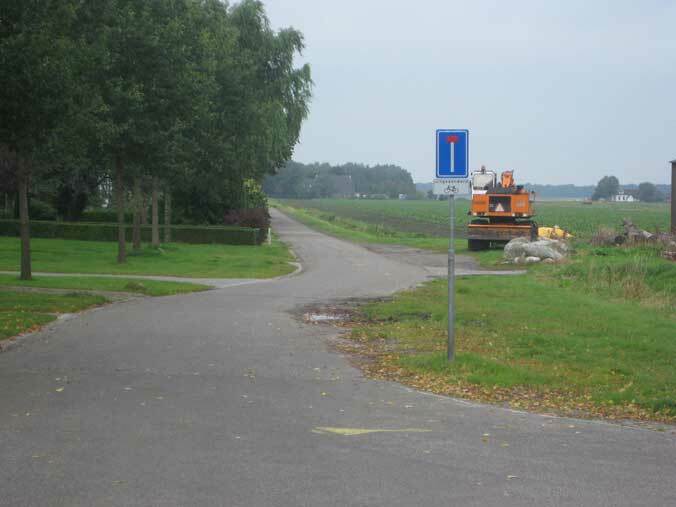 The speed limit in the villages was re-enforced by a tiled road surface that makes the road a bit noisy to drive on, but which still allows comfortable cycling. Importantly, we found cyclists were never pushed into the traffic calming constrictions. No conflicts between cyclists and motor traffic are created by Dutch traffic-calming measures, in contrast to their UK counterparts. The cycle paths take cyclists round the pinch-points, to merge cyclists into the traffic on the road after it has been calmed. 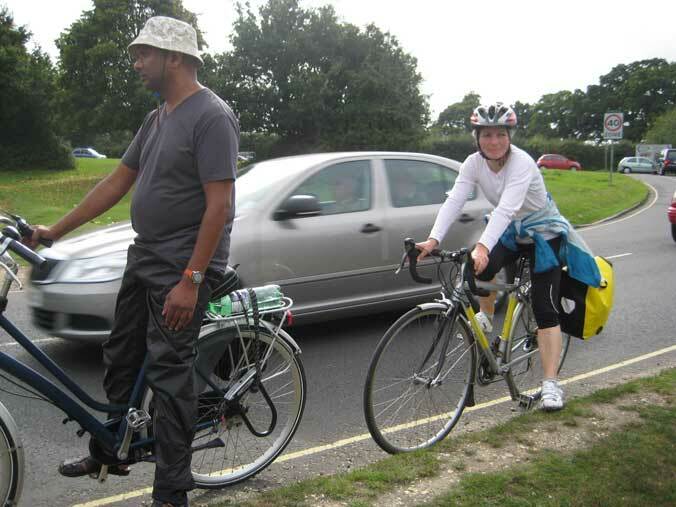 Whereas, in the UK pattern, cyclists are typically forced into the traffic at a point just before it has been calmed. A further important lesson here, applicable to cycle provision in both urban and rural environments, is that, just because there is restricted width on sections of a route, this does not mean that cyclists should not be fully protected where the width is available. But different measures are needed according to the space available. Traffic calming on the edge of the village of Loon, Assen. This is just south of the road shown above. Cycle paths take cyclists round this obstruction on both sides, and the road beyond is shared. Elsewhere in the Drente countryside, minor roads that used to be for cars have been converted into cycle-only roads. These look like standard country roads, but for cars they lead nowhere, or only provide access to a few houses. For bikes, they provide high-quality surfaces for fairly long-distance, speedy rural riding, and are connected in with the rest of the cycle path network. So, using this combination of cycle roads, traffic-calmed roads, and cycle paths, anyone living in Assen, or other towns and village around, can easily visit the forests, heathlands, hunebedden, and quiet areas of the Drenthe Aa National Park by bike, any time they want. For cyclists using this network (which is typical of the Netherlands and not exceptional), threatening interactions with motor traffic have been virtually eliminated. We did not see many others in the national park on the Tuesday evening when we visited, but David Hembrow assured us it becomes quite busy at the weekend, when large numbers of people, including many young children on their own, cycle out to experience the closest the Netherlands gets to a wilderness. In contrast, I know that very few of the residents of Southampton, Bournemouth, Christchurch, New Milton and Lymington ever visit the New Forest by bike, and, if they chose to do so, they do not experience the kind of relaxed journey the cyclists of Assen enjoy. They mostly visit their local National Park by car, on the fast roads that our local authorities and Highways Agency provide, in so doing, reduce the subjective safety of the few cyclists using those same roads. And these days, those cyclists will virtually never be unaccompanied children. Those days of my youth are gone. When you cycle through a village in the New Forest, you are restricted to a narrow strip of road not occupied by large numbers of speeding cars. Or, if they are not speeding, you are caught in a traffic jam. Beaulieu, Hants. We could bring those days back. We could re-create the conditions where large numbers of cyclists from towns and cities are attracted to our wilder natural areas, and can enjoy them free from the threats posed by motor traffic. In doing so we could massively improve the absolute quality of the environment in those areas, by reducing motor traffic levels. But this would require the adoption of very different transport policies: Dutch policies, in short, or something very like them. To discover what Dutch policies actually are, and how they work out in practice, was the purpose of the Cycling Embassy of Great Britain visit. There is no substitute for finding out by going there. And, perhaps, in the past, the Dutch have not been as proactive as they might have been in spreading information about what they have achieved in cycling, and how, with the result that many misunderstandings and myths have grown up amongst the British, and other foreigners, as to what Dutch cycling is all about. So it is very welcome that the Dutch have just launched their very own Cycling Embassy to spread more widely the expertise they have gained from 40 years of consistent policy of promoting the bike. The concept of a "Cycling Embassy" was pioneered by the Danes, so it is great to see the Dutch, who actually have a rather more successful cycling policy record, now adopting this tactic as well. (The Cycling Embassy of Great Britain is a slightly different concept: we are an embassy to our own people and government, while the Dutch and Danish embassies are from those places.) The first production of the Dutch Cycling Embassy is the video below, which I highly recommend watching. I think it strikes exactly the right note: inspiring, upbeat, clear, factual and professional; Cycling for Everyone indeed shows what the Dutch approach is all about. If you really want "cycling for everyone", believe me, the Dutch can tell you exactly how to do it. The brick-paved roads are, as far as I can tell, not a road-calming measure, but an aesthetic thing. At least, it certainly does not appear to be a national policy. In my old home town they have been removing brick paving from roads through residential areas precisely because of the noise.